This image was selected as picture of the day for June 19, 2005. Relief map showing the varying age of bedrock underlying North America. This cartographic tapestry is woven from a geologic map and a shaded relief image. This combination reveals the geologic history of North America through the interrelation of rock type, topography and time. Regional surface processes as well as continent-scale tectonic events are exposed in the three dimensions of space and the fourth dimension, geologic time. From most recent to oldest, age is indicated by: yellow, green, blue, red. 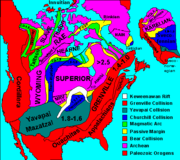 North American cratons and basement rock ages. The red U-shape of the Canadian Shield is clearly apparent. The base of ancient mountains and impact craters, this mineral-rich rock is nearly bare due to recent ice ages. The Canadian Shield is an exposed part of the North American craton, a stable area which extends down the continent along the blue areas, and includes the sweep east of the Rocky Mountains back northward along the pale yellows of the Great Plains, light green across Wyoming and nearly to Alaska. 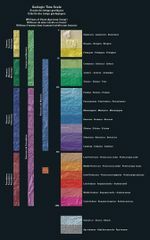 The North America Tapestry of Time and Terrain (1:8,000,000 scale) is a product of the United States Geological Survey in the I-map series (I-2781). This map was prepared in collaboration with the Geological Survey of Canada and the Mexican Consejo Recursos de Minerales .